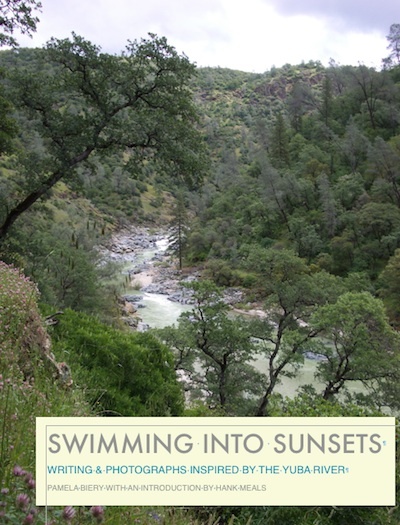 My slim chapbook of Yuba River photos and images has become an e-book, offered at iTunes. Swimming Into Sunsets is available as an e-book on the iTunes book store for $4.99. 20% or more of book proceeds will be donated to the South Yuba River Citizen’s League (SYRCL). Learn more at yubariver.org/. “If you love a place enough, and take the time to listen to what it is saying, the poetry of that place will reveal itself to you. This kind of attention has given us a new collection of poems in Swimming Into Sunsets. Dive into these page and hear the sound of water on stone and remember feel the summer air once again on your skin.”—John (Jack) Muir Laws, naturalist, artist and author The Laws Guide to Drawing Birds (2012), Sierra Birds: a Hiker’s Guide (2004), The Laws Guide to the Sierra Nevada (2007). “Pamela’s Yuba River insights are those of an intimate observer and a loving neighbor.”—Jeffrey Kacirk, author Forgotten English. “A beautiful book of poems, whistling from the river, by Pamela Biery. Her words and photos are inspiring and lyrical, carrying us like water to her favorite river spots in this relaxing, healing, vibrant little book.” —Susan Goldsmith Wooldridge, author of poemcrazy: freeing your life with words and Foolsgold, a book on creative process.